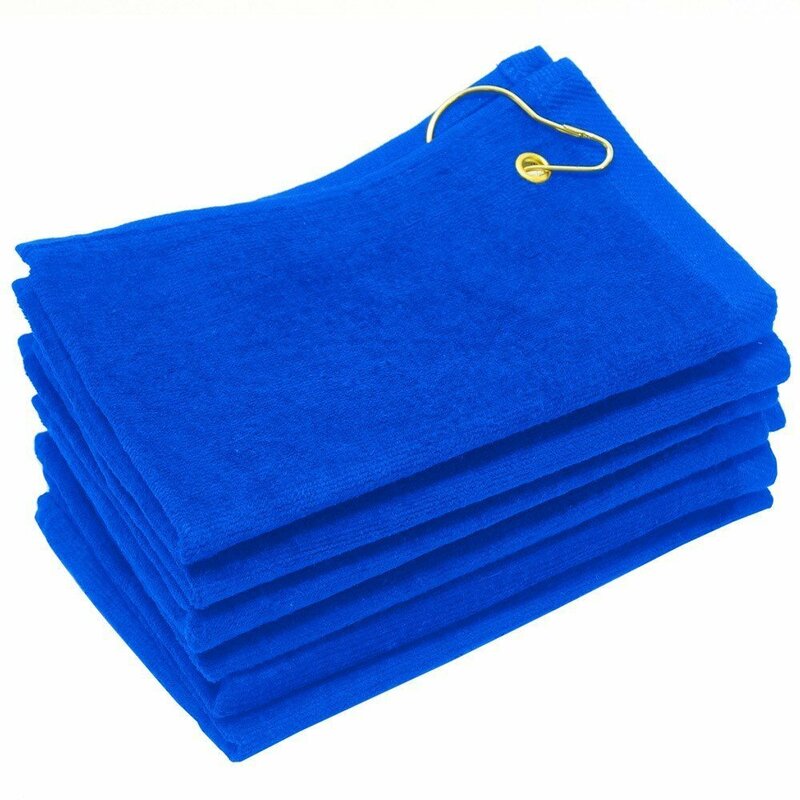 100% cotton high quality terry velour golf towels in royal blue. These towels have a corner grommet ideal for use in golf courses, easy to hang. Aside from a set of trusty clubs, every golfer depends on towels. Now, you can offer your golfers wholesale golf towels with a convenient grommet. These royal blue beauties are ready for the greens right now. Not only will they send the message that you're prepared to pamper your patrons, but they'll hold up round after round. Golfers consistently use towels like these blue golf towels to do everything from wiping their hands to cleaning their irons and woods. Make their lives easier by supplying them with 16" by 26" terry velour towels today. The more units you purchase, the lower your wholesale rate per-towel becomes! Could Your Business Use a Blue Golf Towel With Grommet to Woo Customers? Golf fundraiser giveaways. Golf fundraisers happen seasonally, and they're always a hit. Instead of assuming that golfers will bring their own towels to your event, why not supply them with it as part of their "swag bags?" It's a small way of thanking them for their support and participation. Golf club rental bonuses. Do you regularly rent out golf clubs to people who play at your course? Sweeten the rental a bit by throwing in a blue golf towel with grommet attached. It's a nice giveaway that doesn't cost too much. Retail merchandise sales. Can you resell a blue golf towel? Of course! But first, make sure you add your monogram or business logo. That way, you can turn it into a profit-making venture. Marketing incentives. Want to give your best clients who golf something other than a coffee mug? How about a golf towel with your corporate name or branding image? You'll hit a sweet spot! Family get-together giveaways. Do you have a huge family get-together every year? Looking for a unique reunion gift? Wholesale golf towels are great for any golfing-filled family tree. Absorbency. Thirstiness is never a problem when you use a blue golf towel made of plush velour. It drinks up moisture. Hardiness. Who says a towel can't handle several seasons of golf? These towels are built to last from the first to the 18th hole. Softness. There's nothing wrong with a little pampering, especially for a golfer who's having a rough day — or a day in the rough. Terry velour is soft, even on sensitive skin. Best of all, clean-up is simple with blue golf towels. Just wash and dry them with like colors, and you'll be set for the next round!